Governor Reynolds announces the Flood Recovery Advisory Board. Governor Kim Reynolds is creating a new state board to oversee the response to last month’s catastrophic flooding. 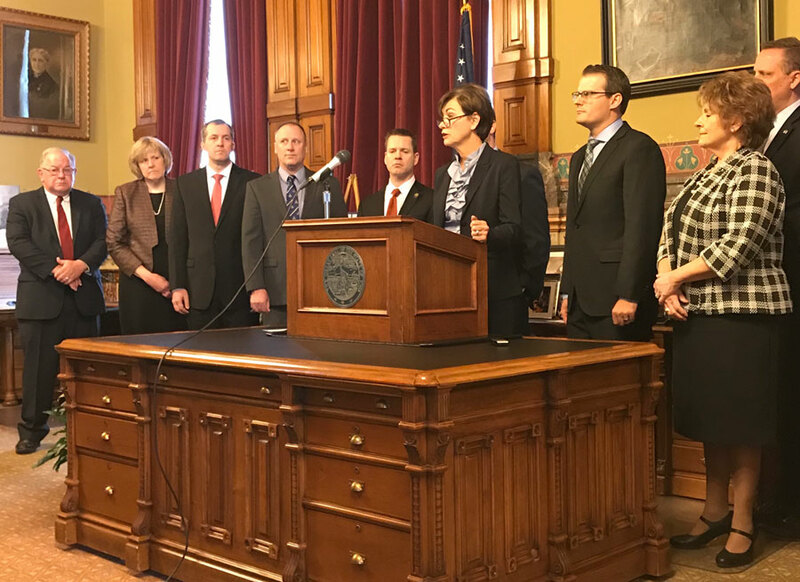 “To move forward, it’s critical that we not only provide funding at the state level, but also have a central point of coordination and plan to use the funds,” Reynolds said late this morning during a news conference in her statehouse office. Reynolds issued an executive order this morning, establishing a 15-member Flood Recovery Advisory Board. She’ll be the board’s chairwoman. “This recovery will be difficult and it will be complex and it will require significant coordination at the local, state and federal levels,” Reynolds told reporters. The governor also is asking legislators to set aside $25 million in state funds for flood recovery. The first $15 million would be used for flood mitigation, including help in making levee repairs. House Speaker Linda Upmeyer, a Republican from Clear Lake, said responding to the housing need in flooded areas is a priority. Senate Majority Leader Jack Whitver, a Republican from Ankeny, indicated there’s room in the budget for this extra spending. “We are proud of our conservative budget that has provided resources to help address a natural disaster of this magnitude,” Whitver said. The governor says she’s asked federal officials if there are ways the state can line up contractors or take other steps that would speed up the process of buying out flood-ravaged properties. FEMA’s website indicates it’s a lengthy process that can take a year to 18 months. Reynolds said she’s asked FEMA to set up a “mini processing center” in Council Bluffs where flood victims may find out what disaster asistance may be available.